Straight from the New Yorker’s Culture Desk we have Chris Suellentrop’s piece on ‘The Video Game Art of Fumito Ueda’. It’s a little bit purple in places (what writing about games in a mainstream newspaper isn’t?) but it’s still quite worth reading. Suellentrop also quotes from Tom Bissell’s Extra Lives, referencing some comments of our next entrant this week. 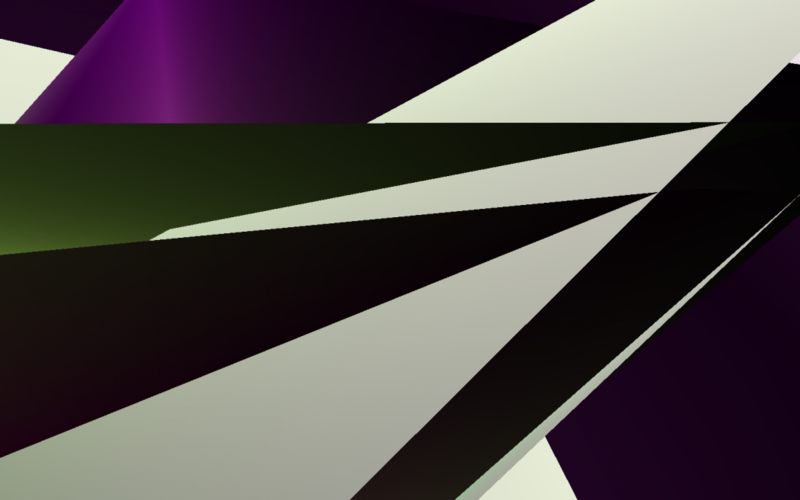 Clint Hocking’s post this week is a surprisingly self-effacing thesis for a game designer: he reckons that in videogames the players themselves are the creators and artists. Definitely go read his “Nature of Videogames” post. Hocking has been making this point for a few years now, but this is another great examination of it. It is raining by the time I get to Rorikstead, a small weatherbeaten farm on the far end of the tundra. Small plots are ringed in by a low wicker fence. An uptight woman works her crops of potato, wheat, and cabbage. “We’re honest, hard-working folk here and we don’t suffer beggars or thieves,” she says. I pick all of her crops and sell them back to her, saving one of each to taste for myself. The wheat is edible but unappealing. Sexism in games remains an unsolved problem, it’s clear. Some of you will be nodding along, and some of you will hear the s-word and roll your eyes and go, “oh, this again?” You guys can piss off-–go click on some new screenshots or a trailer consisting of a release date slowly fading into view. You’re hopeless. Sitting down to play Call of Duty: Modern Warfare 2 with a friend in split-screen, it often feels as if there’s a third presence in the room – an invisible game designer sitting between the controller and the television, who anticipates my own movements, says “oh, you want to shoot the guy on the left? I see, let me get that for you!” and pulls my crosshair in the right direction. Actually winning in such a scenario feels less about my skill in the fundamental act of shooting, and a lot more to do with my ability to simply select the right targets at the right time. At the Pop Matters moving pixels blog, Jorge Albor Nick Dinicola discusses Rage’s excess of empathy, drawn out of him by the excruciatingly detailed character animations. I once spoke to someone about a conversation she had with a schizophrenic man. The man described disembodied voices coming from over his left shoulder. They would comment, offer advice, and sometimes issue commands. The nature of their words were often violent and dangerous, and the man had learned mostly to ignore voices coming from that direction. Not above trivialising a serious mental disorder, I reflected that it must be a lot like playing videogames, except that in videogames you’re supposed to listen carefully and do exactly what the voices tell you. a videogame’s standout feature, a feature that is possessed by no other medium, is that it gives the conceptual author an analyzable presence…The author is systematized, sometimes by the creators (Pac-Man), and sometimes by the system itself (the kill screen). That embedded author “who” we have such difficulty describing, such trouble pinning down, is in videogames preserved in ones and zeroes. At the excellent group blog Play The Past, Shawn Graham sings the praises of the point ‘n’ click adventure game. You will die, and you will die often. And the kicker? After each death, your foes will laugh at your corpse. Despite its toothy grin and good sense of humor, sometimes I just want to punch Uncharted 3 in the nuts. At Significant Bits, Radek Koncewicz looks at a number of irresistible, gratuitous actions in gaming. It’s important because it’s talking about things that the player doesn’t have to do, but instead wants to do. Very cool. What separates Wither from games like Jason Rohrer’s Passage that try to grapple with the same kinds of human existential problems? Passage tries to mechanically represent emotion through gameplay (e.g. walking forward in time and watching one’s loved one age and die) that leaves absolutely no room for interpretation. In contrast, through strangely poetic moments like having bizarre nightmares and witnessing suicides, Wither leaves the protagonist’s psychological world open to interpretation. 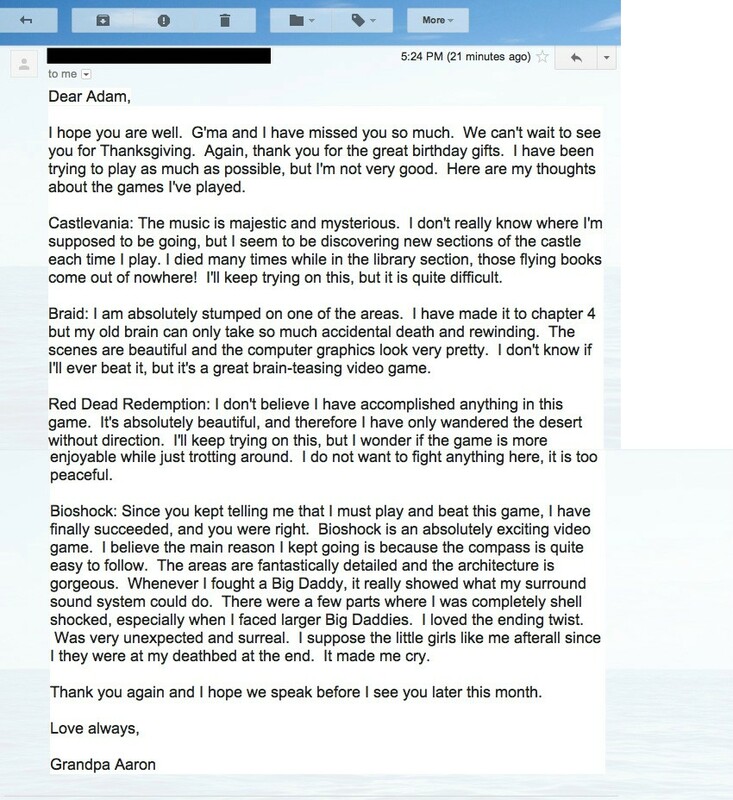 I’m not really sure where this image comes from, as our own Eric Swain linked us to it without explanation, but it seems to be an email from “Grandpa Aaron” talking about all the games he’s enjoyed, including Castlevania, Red Dead Redemption, and quite a superlative description of his enjoyment of Bioshock. Mary Flagnahan blogs “The Twelve Propositions” about games at the Tilt Factor blog. These “Twelve Propositions from a Critical Play Perspective” start with the following: “#1 – Values are everywhere, designed into play and into games”. Interesting and provocative. And two videos to close out TWIVGB this week. First, video blogger ‘Egoraptor’ has an excellent video in his ‘Sequelitis’ series discussing the mechanical changes between the original Mega Man and the sequel Mega Man X – changes that are thematically important and rich with meaning. That’s it for this week, but a special thank you to everyone who sent in links (even those that didn’t make it in). Keep sending stuff in as we really do rely on you lot telling us about stuff we’d miss otherwise. Hit us up on Twitter or via email, as usual.